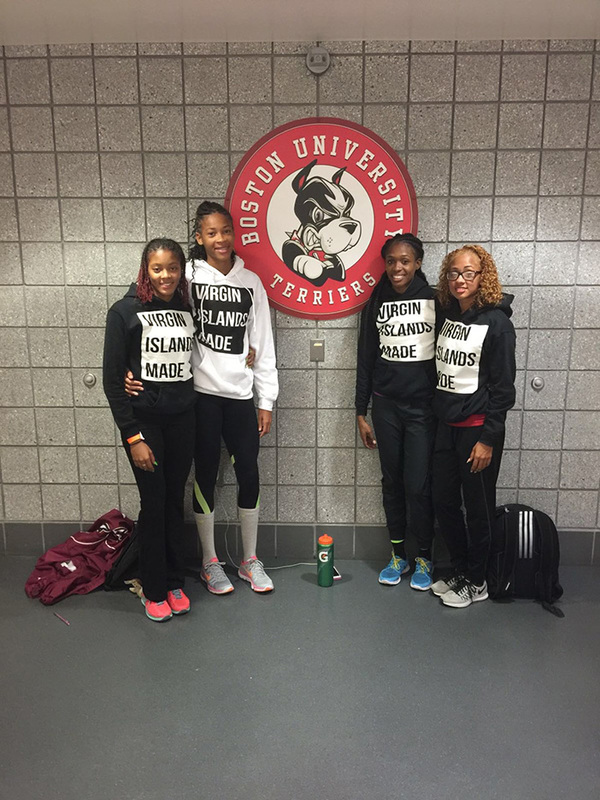 For the fourth straight week an indoor record has been broken as marks were set during a busy weekend for BVI athletes in Boston and Arizona. Records were established for 13 straight weeks in 2015. Competing at the Boston University John Thomas Terrier Classic on Friday, Ashley Kelly kicked off the banner weekend that saw BVI athletes winning several heats of the competition and being among the Top 10 performances. Kelly ran 23.69 seconds to win the third heat of the 200m with the competition’s second best time, ahead of Karene King’s 23.92, to claim King’s 2-year old record of 23.73, also established in Boston. Kelly was second in her 400m heat and fifth overall in 53.47 seconds, a season’s best effort. To wrap up Friday’s competition, the Sprint Tech quartet of Tarika “Tinkerbell” Moses, Beyonce DeFreitas, King and Lakeisha “Mimi” Warner, became the first BVI foursome assembled for an indoor 4x400m Relay. They won the third heat, beating Boston College by two seconds as well as Morgan State and Manhattan in the process, with a time of 3 minutes 45.34 seconds. The time was the sixth best mark of the competition and established a BVI record in the process. In other individual competition, Moses outdistanced the field to win the 500m overall with a time of one minute 11.60. Warner—who won heat 5—placed fifth overall in 1:13.43, followed in sixth by teammate Jonel Lacey’s 1:13.72 in winning the seventh heat. Judine Lacey took the 10th heat in 1:16.00. DeFreitas was second in her 200m heat in 24.53 seconds and L’T’Sha Fahie— won her 60m section in 7.54 seconds—which stood up as the meet’s second best mark was also second in the 200m in 24.98. In Saturday’s male competition, K’Cei Moses ran 7.09 seconds to win the ninth heat of the 60m dash, while Rikkoi Bratwaithe was eight in the second heat in 7.00. Moses won section 26 of the 200m in 22.25 seconds, while Brathwaite ran 22.36 for second in Section 15. Josh Hill won the 16th heat of the 500m with a time of 1:08.37. Central Arizona College sophomore Tynelle Gumbs, upped her Weight Throw record from 17.28m to 17.84m, in her 2016 debut, to win the Paradise Valley Community College Indoor meet in Phoenix. The mark qualified her for Jr. College Indoor Nationals. Twin sister Trevia was fourth with a heave of 15.27m. Trevia finished fourth in the Shot Put with a fourth round throw of 13.81m. Eldred Henry used a 17.56m effort to win the Shot Put and booked a ticket to the Jr. College Nationals. He was second in the Weight Throw with a 15.62m heave ensuring he’ll see action at Nationals in a second event. Kyron McMaster made his collegiate debut for Central Arizona, with a second place finish in the 400m in 48.93 seconds. He will join Gumbs, Henry and South Plains College’s Taylor Hill who qualified in the 60m, at March 4-5 JUCO Nationals in Winston Salem, North Carolina. St. Augustine Jr. Khari Herbert won this 200m heat in 22.49 seconds at the Camel City Invite in North Carolina. He led off the 4x400m Relay with a 48.77 seconds split, helping them to second overall with a time of 3 minutes 14.79 seconds. In Jamaica, Nelda Huggins was second in her heat and fourth overall in the Queen’s Grace Kennedy Invitational 200m. She debuted with a time of 24.51 seconds. At the Houston Invitational and Multis, sprinter Tahesia Harrigan-Scott ran a season’s best 7.30 seconds to finish third in the 60m dash. She ran 7.36 in the semis.